If you’ve already made your reservations for the first space hotel but have been wondering how you’ll get your beer there — wonder no more. 4 Pines Brewing Company and Saber Astronautics have joined forces to create the first beer designed for space. As you might guess by its name, 4 Pines Brewing Company is a brewery located in Australia. Saber Astronautics is a group of self-described “space gurus” who are working with the brewery on the effort, and also happen to be Australian. It’s an effort that meant rethinking how beer was made. When you’re in space, the way your body handles things like food and drink changes. Your senses dull and your tongue swells, making drinking normal beers a bit out of the question. There’s also that whole lack of gravity thing at play, so figuring out how to pour a beer into a glass isn’t exactly an easy task. The beer is called Vostok, and it uses the baseline recipe for an Irish style stout. They use 17 (!) kinds of malt in its production to pump things up so space travelers can actually, you know, taste the beer while they’re drinking it. According to the group’s site it has an aroma profile of coffee, chocolate and caramel malts and a smooth finish. They figured out the beer part a few years ago, which means its time to work on the bottle. The current bottle design uses modified technology from fuel tanks, which helps it combat the challenges that one might have consuming a beer in zero gravity. 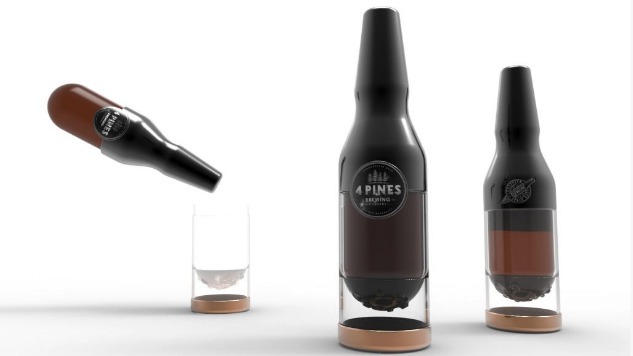 The key design features of the bottle include ‘wicking’ that allows the beer to be poured in zero gravity and a removable cup for drinking when you’re back on Earth. The bottle is still in its production phase, but the duo have started an IndieGoGo campaign to continue research and development in the space, with the goal of raising $1,000,000. If they’re successful, the plan is to start shipping the bottle to would-be space travelers come the end of 2019.